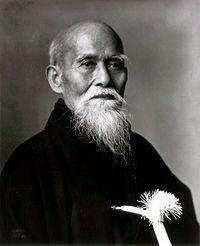 The founder of Aikido, Morihei Ueshiba, was born on December 14, 1883, to a farming family. In his early childhood, Morihei was rather weak and sickly, which led to his preference of staying indoors to read books instead of playing outside. It was during this time in Hokkaido that he met Sokakau Takeda, grandmaster of Daito-ryu Aiki Jutsu. After meeting Takeda and find himself no match for his teacher, Ueshiba seemed to forget everything else and threw himself into training. After about a month, he went back to Shirataki, build a dojo and invited Takeda to live there, which he did. 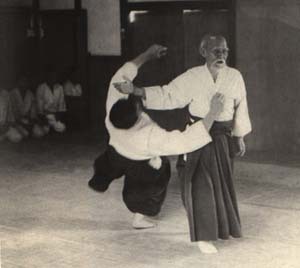 After the war, Aikido grew rapidly at the Kobukan (now called Hombu Dojo) under the direction of Kisshomaru Ueshiba. 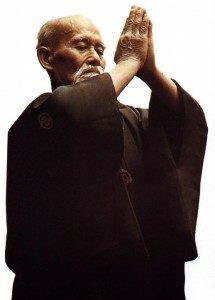 Morihei Ueshiba had become famous as “O’Sensei” or “The Grand Teacher,” the Master of Aikido. He had also received many decorations from the Japanese government. Right up to the end of his life, O’Sensei refined and improved his “Way”, never losing his dedication for hard training. Early on the morning of April 26th, 1969, the 86-year-old O’Sensei took his son’s hand, smiled and said, “Take care of things” and died. Two months later, Hatsu, his wife of 67 years, followed him. O’Sensei’s ashes were buried in the family temple in Tanabe. Every year a memorial service is held on April 29th at the Aiki Shrine in Iwama. “Failure is the key to success; each mistake teaches us something”.